Watch some of the most dramatic drawn out rallies on a badminton court, and you’ll realise that patience is most definitely a virtue. As each player mixes up their range of replies, from short-range pushes and taps over the net to more testing forehands and backhands to the rear of the court, they are engaging in a mental battle as much as a physical one. The question is, who is going to crack first, lose their nerve and rush an attempted winner that will be sloppy in its execution and leave the door open for a kill? It can happen to the best players, sometimes because mentally they are feeling low, their technique has been letting them down, or they’ve allowed a questionable line call to eat into their psyche.Whatever the reason, when that crack in the mental armoury occurs, the opponent won’t need a second invitation to take advantage. In an ideal world, both players would walk on court, totally focused, totally concentrated on the job in hand. Given comparable levels of technical ability, the one that walks off triumphant will be the one that retained that focus. Retaining it means you’ll have to be patient when probing for a weakness, or when a point or a series of points doesn’t go your way. On no account begin to question your own ability. Don’t let your temper begin to influence your performance, either. 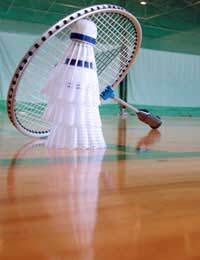 During the course of a long match, almost inevitably there will be contentious decisions, or a moment when the shuttle almost dances on the top of the net before falling, depressingly, on your side of the court. You’ve just got to dig in mentally, realise that you must not fold because your time in the match will come, whether that be because your opponent tires physically or begins to become over confident. If you’ve let the match slip irrevocably in their favour, then there will be no route back. However, if you’ve hung on in there and remain within striking distance, when the pendulum does swing in your favour, you’ll be in a position to build up some momentum and, hopefully, seize the initiative and turn the match decisively. This isn’t to suggest that some players are immune to inner demons. Simply that the best players know how to conquer them calmly and quietly. In contrast with this controlled approach, the most counterproductive response is to begin showing outward frustration. This will only lead to your game falling apart. And if your opponent needed any extra incentive to go for the kill, now he or she has it. It will be obvious to them that you’ve lost the mental battle and are seeking a scapegoat, whether that be lady luck or your long suffering racket. The more progress you make in the game, the more the mental side of it will become important. Swatting opponents with less ability is all very well. It is only when you meet an accomplished adversary that the real test will begin. Staying calm in this situation will be a challenge, but one that should you overcome it, will add an extra weapon to your armoury.